FOXBORO -- Tom Brady has been very open about how he plans on playing in 2019 and beyond, but his tight end wasn't exactly ready to make the same kind of proclamation Thursday. "Oh, I mean I haven't been thinking about that at all," Rob Gronkowski said when asked about his football future. "We're on the last game, going into Week 17. We got the Jets and that's all I'm really worried about as of now." Gronkowski got introspective later in his press conference, however, hitting on everything from why he continues to enjoy football, to how he's managed his emotions during what he's admitted has been a challenging season. Going into the regular-season finale, Gronkowski has 45 catches for 658 yards and three touchdowns. The Patriots added $4.3 million in incentives to Gronkowski's contract in the offseason, including $1 million in per-game bonuses and $3.3 million if he reached certain statistical measures. Gronkowski won't hit any of those statistical markers as he's on track to record his lowest yards-per-game number (54.8) since his rookie season (34.1). If he doesn't score against the Jets, he'll tie a career low for touchdowns. "I would say every season presents a different challenge," Gronkowski said. "You go through things. You get dinged up a little bit, different challenge. Come back from something. Come back from something different. Every season brings its own little challenges and you just gotta keep on grinding, keep on staying positive, gotta stay focused. You can't ever get down, too down. Then you just dig yourself a bigger hole." There were times this year when Gronkowski didn't do all that good a job of hiding the fact that he was down. He admitted after a Week 3 loss to the Lions that the Patriots tried to trade him in the offseason, but said defiantly that he wouldn't be playing with any quarterback other than Tom Brady. He thanked Brady for throwing to him late in a win over the Chiefs in Week 5, and Brady went out of his way to laud Gronkowski after the fact in what seemed like an attempt to boost his teammate's spirits. He walked out on a press conference on Halloween when he was asked about his confidence level. Gronkowski has been on and off the injury report with back and ankle issues this season. 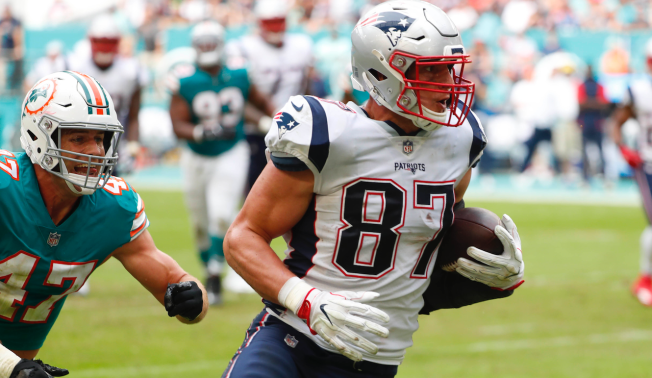 When it comes to playing through injuries or coming back from an injury, Gronkowski acknowledged that the mental hurdles are significant to overcome. "It's definitely a challenge," he said. "That's probably 50 percent of it. Yeah, you can have the physical tools and everything. If you're not mentally there all the way, then you're not going to be able to use the physical tools how you want to use them. Definitely you just gotta stay positive. "You learn a lot of things every single year about yourself as you get older on how you adapt to things. You just learn that you gotta stay positive. You can never get too down on yourself. Yeah, you can get down on yourself a little bit to get you re-motivated and stuff but you never want . . . That's happened to me before. You get too down and you dig yourself a bigger hole. You just gotta stay balanced. "It's a roller coaster season as you guys have seen all year. But whenever things aren't going right, you just gotta stay positive and keep going and keep doing what you need to do and you know you'll bounce back." Gronkowski remains a regular in the Patriots offense, but he hasn't bounced back when it comes to his on-the-field production. He was held without a catch last week against the Bills. Quick Slants the Podcast: Who's the NFL MVP? Asked if he would like to play as long as Brady is still playing, he said that was "the last thing on my mind right now." But he did say that for this season, he's going to give the Patriots what he can. "I love the grind," he said. "I'm all in. I've been all in all season. No matter if it's been up, if it's been down. I'm gonna tell you this right now: I'm gonna be all in the rest of the year no matter what it is. That's just my main focus, no matter how it goes." Gronkowski insisted he still enjoys the game, first and foremost because of the time it allows him to spend with his teammates. "You gotta [enjoy it]. It's a long season. You got training camp. All of the regular season, you got preseason games. All that. You gotta keep it light. You gotta enjoy your time. No matter how games go up or down, you gotta keep focused, keep it going. Which we have been. We've been through a roller coaster up and down throughout the whole season. What you gotta do is stay focused and keep preparing and mentally and physically just keep grinding and keep going." For how much longer Gronkowski keeps going is anyone's guess. His base salary bumps up to $9 million in 2019 -- the final year of his contract -- and his cap hit will reach $12 million.